Things are finally starting to fall into place and settle down some in my corner of the world. I can see once again and things with the new house are coming together - now to actually pack for the move in a few weeks.. .and pray that our current house sells soon! I was also able to finish the e-magazine for ZnetShows.com. This Summer 2015 issue features their cultured sea glass beads and is packed with a ton of inspiration. You can totally see all the hard work the designers put into this issue. I so appreciate all their time and effort! I also contributed to the e-magazine's upcycled jewelry section (surprise, surprise!). I picked a simple palette of teal, clear, moonstone, and black. 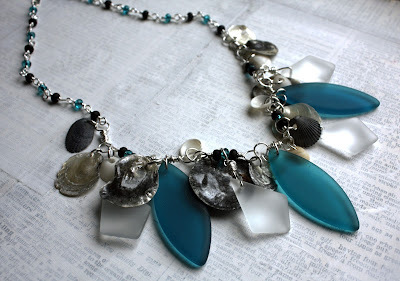 Knowing that the Summer issue focused on sea glass, this brought thoughts of the beach to mind. I instinctively pulled out my (large) selection of seashells and selected a few. The handful of shells I decided to use in my first piece for the magazine. I cleaned the shells and tried to make the jingle shells a little more sturdy with some nail polish. From there, I made a chain with the small sea glass beads, Chinese crystals, and silver non-tarnish wire. Using silver tone jumprings, I hung the fabulous sea glass marquise spindles and diamond-shaped pendants from the chain. For my next piece, I was inspired by my key collection. I picked one at random and shined it up a bit. Next, I plunged into the bits and bobs of broken jewelry I have stashed and picked out a piece of filigree that matched fairly close and fit over the key well. 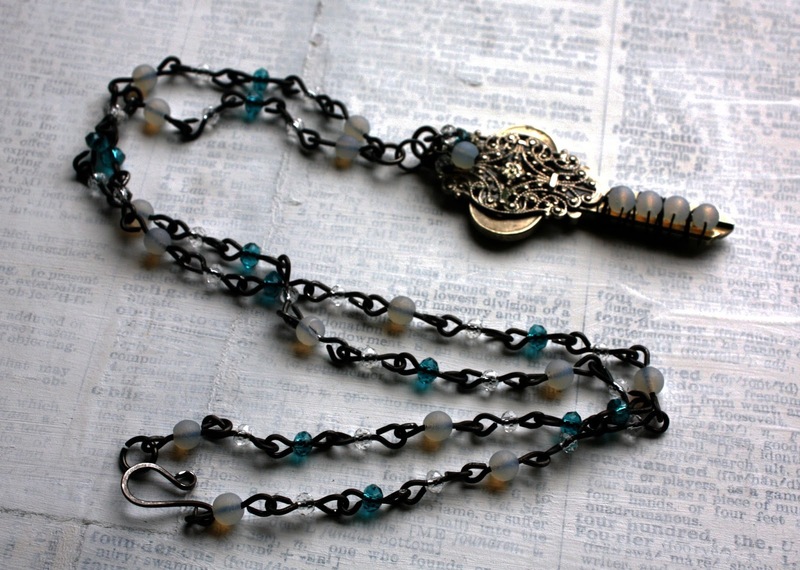 Once I had the filigree attached to the key, I wire-wrapped the 4mm moonstone opal cultured sea glass around the key with 24g dark annealed steel wire. The chain is made from more of the sea glass beads and Chinese crystal rondelles with 20g steel wire. As well, I used gunmetal headpins to create a few dangles of all of the beads to hang in front of the filigree. Finally, I was compelled to pull out some buttons. I sorted through my button cards to find some with summery, cute character. With some antiqued brass jump rings and handmade ear wires, these became great earrings with the crystal sea glass diamonds. I included some tips for working with upcycled materials and more information in Creative Spark Summer 2015 that you'll have to go there to read. I'd love to know what you think of it and/or my contributions. Hopefully, I'm back. . .but with the big move and all the renovations we have to make, I can't promise anything. Though, I'd really like to keep y'all in the loop. Stay tuned to see what happens next! Very nice work. Can't wait to see pics of the new place...hope the old one sells soon. Keeping my fingers crossed for you! Judy, Thank you! I really want to do a whole series on the new house as we renovate/repair it. Of course, many times I get so busy that blogging is the last thing on my mind. That really needs to change. Thank you so much for the best wishes. It'd be awesome if this place would sell. It would take a load off our minds! I was really glad to see this post, Hope! You have managed with the magazine and even made some gorgeous jewelry! I love the sea theme and all the sea glass in this issue, will definitely check it out multiple times! I am glad you can see the light at the end of the tunnel. I am amazed you created as much as you did with the amount of things on your plate. I love your found key and filigree piece as well as necklace with diamond shaped pendants. Your button earrings are very cute. Well done! Yup, glad you're back even for a little while, Miss Hope. Love all the beachy coolness of your first design. 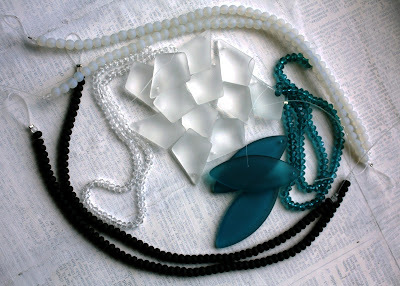 Love the manufactured sea glass, in all the colors and shapes available. So great for summer casual clothes. The magazine looks wonderful and your color choices are spot-on. At first I was surprised you chose black to go with the other colors, but it looks wonderful with the softer shades and gives it a defining look. Congratulations on another beautiful issue. We just got done moving ourselves and it is crazy! Boxes everywhere still. You are extremely talented! Jessica, Yes. . .moving is insanity! I still have SO MUCH to pack. It just keeps overwhelming me so I just avoid it. I don't think that's going to work for much longer. I'm looking forward to the new house though! ;) Oh, and thank you so much for your kind words. Those glass pieces are so pretty. Glad to see a post from you. Does this mean your eyesight is back? Thank you! My eyesight is indeed back. I've spent it getting this magazine completed. Now to pack!! The craft room is almost done (I had to start there to get any distractions out of the way so I can work on packing the rest of the house) Hopefully there will be more to come soon...most likely about the move and new house. 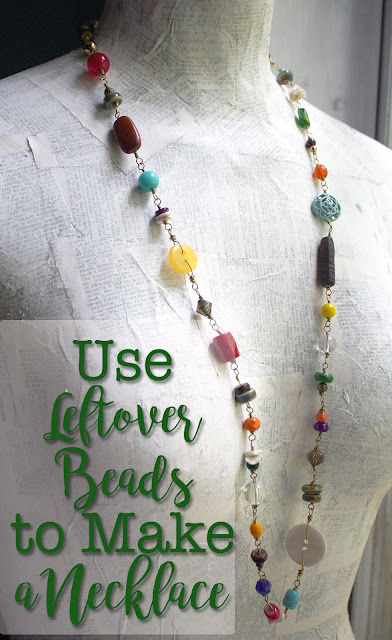 you are such the master crafter with upcycling! 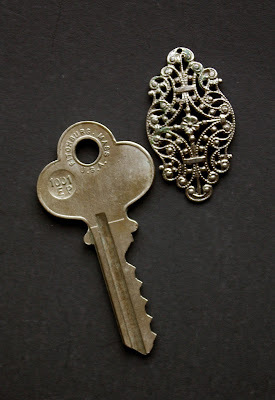 what a fantastic idea to use a filigree with the old keys ... I have a tin of keys, and trying to figure out how to use them! 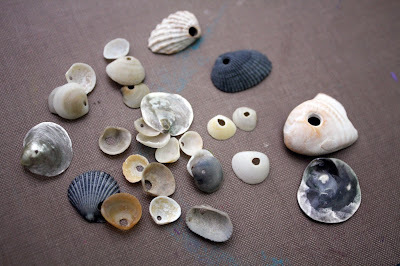 of course you know I LOVE the shells - what a gorgeous necklace that is, and love how you use buttons - just perfect. thanks for another terrific issue and sending out sea glass to work with! I love creating with it! Beautiful work! I really love the first necklace for summer. The sea glass and shells go perfectly together. What you did with the key is very cool! It makes for a great pendant shape. Best of luck with the move and selling your home. I've been through it a couple of times and know how stressful it can be! I love the key and filigree piece. You are right. It is exquisite! I wish I could spend about 5 minutes inside your creative brain. I know I would be so inspired! Kim, Thank you! That particular piece is my favorite of the three also. I wish I had more time to be creative nowadays, however I must wait for the moving to be complete first. Sigh! Thank you for your sweet support!